OUTSTANDING contributions to the Woking community were recognised at the Mayor’s Civic Reception last week. Susan Deaves was named Eminent Citizen for 2018 for her lifelong contribution to athletics in the town. 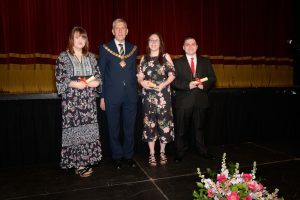 There were three winners in this year’s Young People’s Civic Award Scheme – Harriet Pringle, Francesca Lane and Leon Hunter.